One part that is missing from a lot of eBay "treasures" is a part that was never assigned a part number - the box latches. These were made out of steel and washed in brass until 1957 when the lithographed sets had latches which appear to be Cadmium plated. 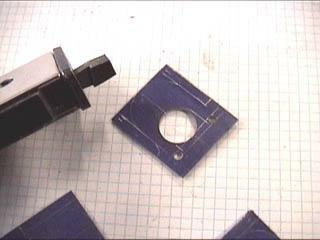 This tutorial will show you how to make reproduction latches. 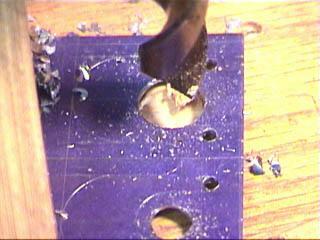 Next, center punch and drill (2) 3/32" holes at the outside edges of the bottom slots. 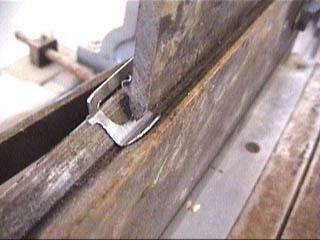 The outside edge of the hole should be at the edge of the scribed line. You don't see it in the picture, but the sheet metal is clamped to the table. 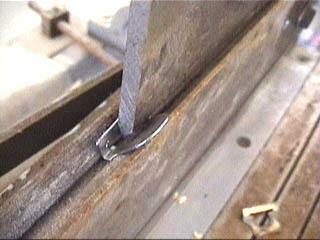 Drilling unclamped sheet metal is a good way to make an unintensional saw blade. 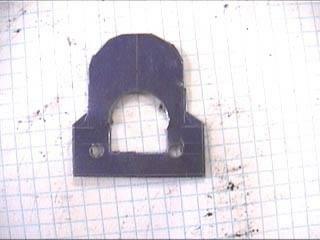 I used a sheet metal shear to cut blanks. A tin snips or aviator snips would work also. 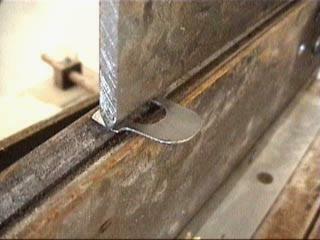 There is a handy sheet metal shear/punch called a "nibbler" which I used to trim the inside hole of the blank. One source for a "nibbler" is Radio Shack for about $10. 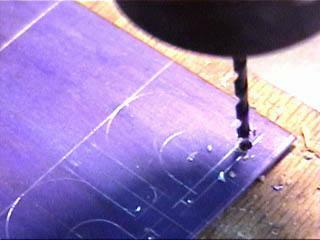 The inside features and outside radii are filed with needle files. 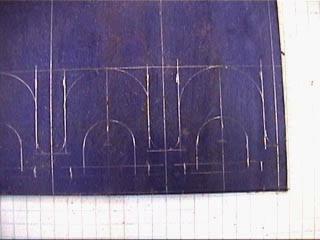 One tip here; position the blank up/down so the bottom scribe line is flush with the vise jaws. Then file down right to the jaw top. Now is a good time to file any burrs from drilling, shearing, etc. I cleaned up the surface with a wire brush. 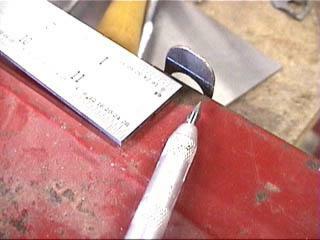 Two tips here; grip the blank only at the bottom as shown with a vise grip or pliers. 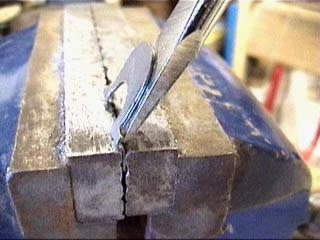 If you use a vise grip on the "show surface", make sure you tape or protect the surface from the vise grip jaws; they'll leave marks. 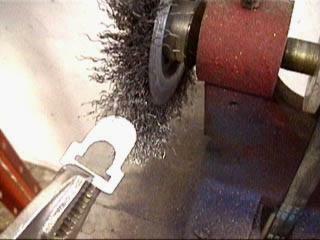 Second tip; with wire brushes it's a good idea to wear a full face shield. 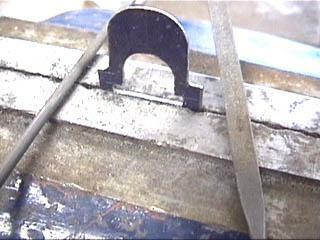 The wheel can/does throw wire pieces which are essentially needles. I did the 1st latch bend with a press break. This is one of those Taiwanese all-in-one sheet metal machines with shear/break/slip roll in one machine. 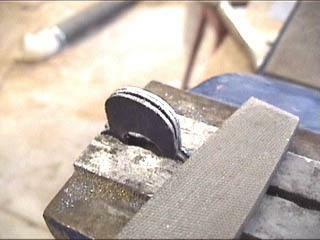 The bend could be done in a vise also. 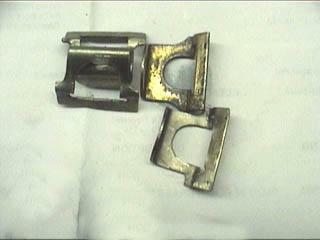 The blank is electroplated with the setup shown here. I use a brass plating kit from Caswell Plating (www.caswellplating.com) called "Plug 'n Plate". The brass kit costs $35 and includes a transformer, plating wand and 4 oz. of plating solution. 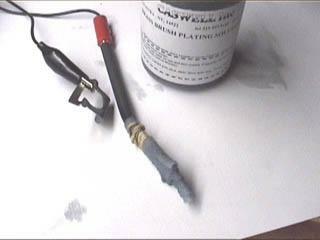 Plating is simple, clip the black negative lead on the blank, dip the wand in solution and wipe the wand on the part. 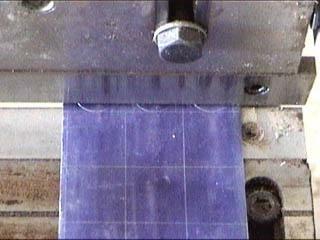 The solution is cyanide free and plates about 1 square inch per minute. There are kits/solution available for nickel, cadmium and other metals also. I wasn't able to get a bright brass finish; more of an antiqued brass finish which looks pretty close to original latches.